Sinfonia concertante for Violin, Viola and Orchestra E flat major, KV 364 (320d) composed by Wolfgang Amadeus Mozart (1756-1791). Edited by Christoph-hellmut Mahling. For violin, viola, orchestra. This edition: Stapled, Urtext edition. Stapled. Level 3. Score. KV 364 (320d). 76 pages. Duration 25 minutes. 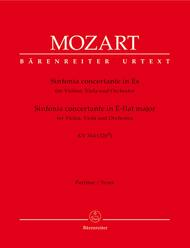 Published by Baerenreiter Verlag (BA.BA4900).ISBN 9790006460182. 31 x 24.3 cm inches. 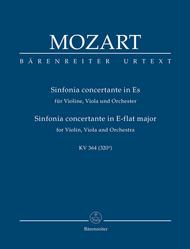 Sinfonia concertante for Violin, Viola and Orchestra E flat major, KV 364 (320d) (Konzertante Sinfonie). Composed by Wolfgang Amadeus Mozart (1756-1791). Edited by Christoph-hellmut Mahling. For 2 oboes/2 horns. This edition: Stapled, Urtext edition. Stapled. Set of wind parts. KV 364 (320d). Published by Baerenreiter Verlag (BA.BA4900-65).ISBN 9790006460199. 32.5 x 25.5 cm inches. 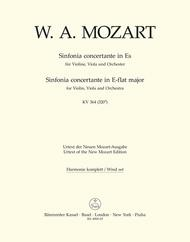 Sinfonia concertante for Violin, Viola and Orchestra E flat major, KV 364 (320d) composed by Wolfgang Amadeus Mozart (1756-1791). Edited by Christoph-hellmut Mahling. For violin solo/viola solo/orchestra. This edition: Stapled, Urtext edition. Paperback. Barenreiter Study scores. Level 3. Study score. Language: German/English. KV 364 (320d). 74 pages. Duration 25 minutes. Published by Baerenreiter Verlag (BA.TP176).ISBN 9790006201549. With Language: German/English. 22.5 x 16.5 cm inches.